KAUSHAMBI, KUSHINAGAR, MAHARAJGANJ, PRATAPGARH, RAEBARELI, SANTKABIR, NAGAR, SIDDHARTH NAGAR, SULTANPUR. and outstanding sports person are eligibile for Indian Army rally bharti Faizabad. GENERAL DUTY, SOLDIER TECHNICAL, SOLDIER CLERK/STORE KEEPER, SOLDIER TRADESMEN AND SOLDIER NA & NA (VET). 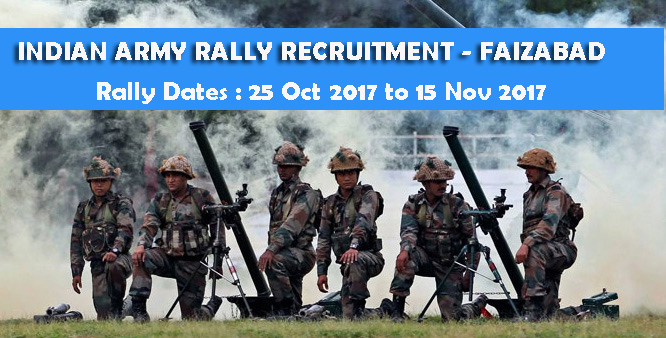 Rally Dates : 25 Oct 2017 to 15 Nov 2017. All Candidates will register themselves through official website www.joinindianarmy.nic.in. The Online application is started from 26 Aug 2017 till 09 Oct 2017. To register Online click on Apply/Login link in JCO/OR enrolment. After that registration page will be open. If you are registered already then use your previous User name and passwerd. (i) Pre-Height Check by Height Bar. (ii) Checking of Barcoded Admit Card printed by the candidates. (iii) Physical Fitness Tests (PFT). 1.6 Km Run, Beam (Chin up), 9 Feet Ditch & Zig Zag Balance. (v) Documentation Check and Interview by Screening Director. (vii) Interview by Host Director and issue of admit card for CEE. (b) Stage II. Common Entrance Examination (CEE). (c) Stage III. Evaluation, Preparation of Merit List and Arms Allotment. (d) Stage IV. Dispatch to the Training Centre.